Amy Gutierrez is a reporter for Comcast SportsNet Bay Area. She covers the San Francisco Giants, gives her take on the action during the game, and provides insights on what makes players tick. She’s also an author. Amy has written two children’s books about her love of baseball. The first was Smarty Marty’s Got Game, which was illustrated by Adam McCauley. 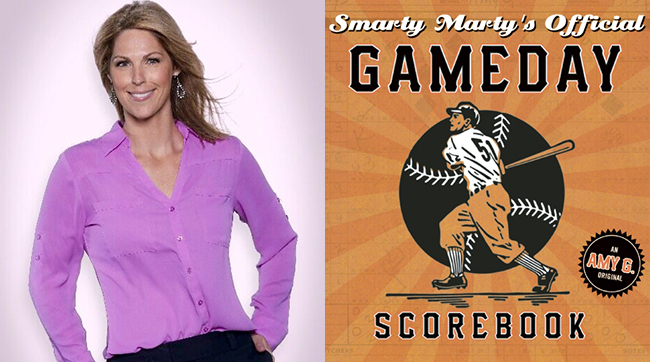 Last year, she combined Smarty Marty with her passion for scorekeeping in the follow-up book Smarty Marty’s Official Gameday Scorebook. I recently caught up with Amy G. to interview her about the books, what made her want to be an author, and what it’s like to interact with professional athletes and pint-sized fans. 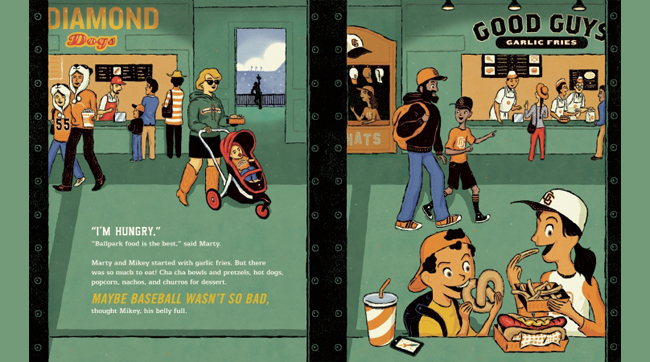 What made you want to write a book about baseball for kids? I had no desire to become an author or to be published. It wasn’t really on my radar. My job covering the San Francisco Giants and being a full-time parent was about as much as I could handle. 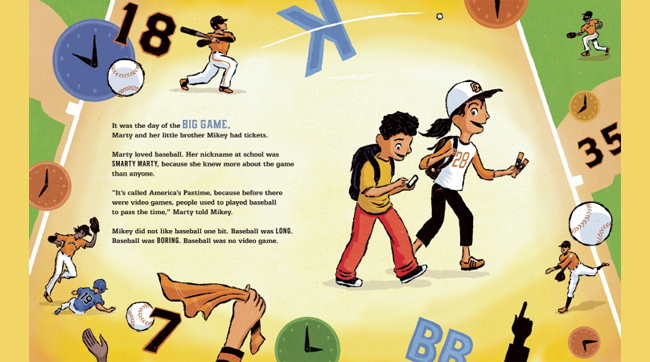 But in 2012, a small publishing company called Cameron and Company here in in Petaluma, CA, approached me and said, “What do you think about writing a children’s book about baseball?” They said there weren’t a lot of baseball books for children. Paralleling this was my very special relationship with my grandmother, who was extremely sick. Fast forward and the Giants go to the playoffs, they win the World Series, and my grandma passes away. She got to see them win World Series and she got to see me in the parade, which was Halloween of that year. She passed away on November 12, 2012. And I remember revisiting a conversation in which she told me she really wanted me to do this book project and I thought I could probably immortalize my grandma if I wrote this book and based it on my relationship with her and named the main character after her, which is Marty. My grandma’s name is Martha and we called her Marty. And that is how I came to go forward with the project – it was all to honor Marty. Sometimes it's hard to pick your next book, why should kids pick yours? What sets it apart from other books? I think what sets my book apart is that there is an educational aspect to my book. You don’t read my book and put it down and you haven’t learned anything. 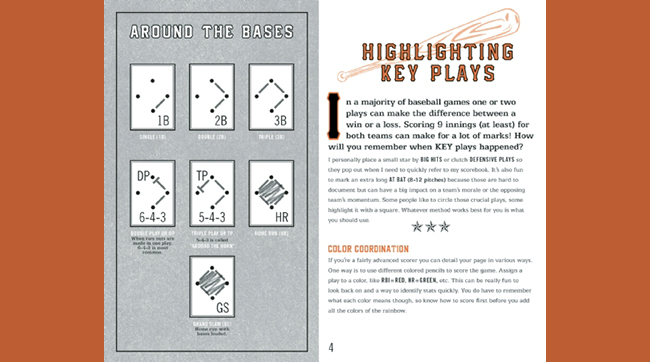 You have learned the first few steps of scoring a baseball game and that’s why this past year we came out with the scorekeeping book, so readers could take it to the next level, score a game, and see how they actually do. I think there is a great message in Smarty Marty’s Got Game that there is no good guy and bad guy. I name the characters the Good Guys and the Other Guys. I think it is a really important message for kids to comprehend in sports today that the rivalries that we see and read about stay on the field and stay between the players and between the lines. There is a message in that: Don’t say good guys vs. bad guys, don’t pit people against each other, because you are not going to get through life with that kind of attitude and that kind of behavior. ​You mentioned the scorekeeping book — what made you want to focus on how to keep score? I keep score at every game I cover and people are surprised. I think I realized it is becoming a lost art. I learned how to do it at 4 years old sitting at my brothers’ baseball games sitting next to my mom, who was scoring. So, when you are reading Smarty Marty’s Got Game you are getting these ideas like, “OK, a strikeout is a K, a fly out to left field is F7, and I can write it however I want — however it makes sense to me.” And then you finish the book and you don’t have anything to go score with – you don’t have a scorebook. The scorebook gives you 40 games that you can go and score, keep track of, and can become part of your memorabilia of growing up or even for adults to look back and see who they have gone to watch play baseball. My grandfather remembers going to see Babe Ruth and that’s a really fun story in my family. If you have a scorecard, you can look back and see what players did that day. It provides good memories for families and it gets people talking if they go to games together. It sparks a conversation – how did you score that? People are so into their iPhones – I hope this helps spur a movement – a movement of conversation. What are some tricks and tips for doing a great job at keeping score? My biggest tip is to use a pencil, so you can erase if you make a mistake. It’s like doing a crossword – never do it with a pen. Use symbols and marks that make sense to you. I would start simply – know the positions and groundouts versus lineouts versus fly outs, have a mark for a foul ball. I use a lowercase f for foul balls and an uppercase F for fly outs. Create marks that tell a story. It is critical for me to know what a player did if I am going to interview him 20 seconds after the game is over. You never know what you are going to come across in a game, and that’s what I love about it. It’s a constant learning experience. If I am at the park for a Giants game, I’ll score – it’s a ritual. How does authoring a kids’ book compare with your day job as a reporter? How are they different and how are they similar? I have a much broader audience as a reporter. When I am at the park, I am talking to an age group that runs from 3-99. The conversations about the book are very specific – they are about the love of the game and how scoring might enhance that love. As a reporter, my role is really to bring you more human interest stories and how a player views the game and what he’s dealing with in life and how that affects the game. ​​Is one type of work harder for you than the other? I think they both have their challenges. It’s the same in the sense that you are figuring out how to connect with people. It’s amazing when young girls come up to me at an assembly and ask how they can do what I do. That’s huge to me because when I was coming up there was no one like me. No one did what I did. My responsibilities for each are different in the sense that I can do book presentations between 10-1 and not miss any time at home with my kids. With games it’s totally different. It starts at 7:15 no matter what. There is a real regimen in the baseball season, and that’s how baseball players survive – it’s through a schedule. How do you juggle being a parent, author, and reporter? Sometimes not very well! They all come crashing down sometimes. You find ways to give yourself a break and find a way to regroup, reenergize, and be better the next day. I have a huge support system. My husband is fantastic and when I am not feeling at 100% he steps in and is amazing and vice versa. My parents are in the same town as I am, which is a huge help for my career and to raise my children. I think a big motto with us is that it takes a village – I’ll take whatever help I can get. I think what makes it work is recognizing that sometimes it’s not going to work and being OK with that. ​​​If you weren't a journalist, what would you be? I probably would have been a teacher and a coach. I still coach as much as I can. I used to coach my son when he was younger and I still coach my daughter in softball and soccer and I love it. What advice would you offer to kids who aspire to be journalists? I would say have an idea of that one job that you think you want to do, but be really open to other jobs in the same industry. I think young adults graduating from college have their sights set on one thing and they don’t know what else to do. One of the best things I did growing up was eliminating what I didn’t want to do. Like, I didn’t want to be a morning producer for news. Have your sights set on that one job, but just get your foot in the door. And have a strong work ethic. Really apply yourself. You don’t shrug and sigh every time a task comes up that you don’t feel like doing. We all had to do it. Now, there are going to be days that you have to do something you don’t want to do, and that’s kind of just too bad. My first job in TV, I tried three times and I had three rejection letters from the station until they finally hired me. So, I think resilient is a word for kids that want to be a journalist. Be resilient. Have a really good sense of yourself. If you’re strong in yourself and confident, you will be successful in anything you do. What advice would give to kids who want to be an author? You need to put it out there. I had a very strange, different experience where somebody approached me [to write a book]. Most authors do not get that opportunity, so I was extremely lucky. If you have an idea and you think it could be a good book, you got to put it out there. Be open to criticism – hopefully it is constructive criticism. Find an author that you admire and write them. But, again, very similar to being a journalist, any job that you are interested in, the biggest thing is to speak to somebody who does it. And that’s where you start.